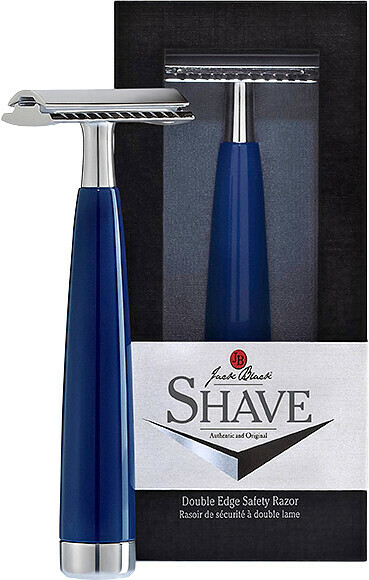 Delight in the results of a close, comfortable shave with the Jack Black Double Edge Safety Razor, a traditional double-edged razor. The Jack Black Double Edge Safety Razor will provide a more comfortable shave with less irritation than a multi-blade cartridge. Its extended handle allows for a better grip and its custom-etched chrome accents will never dull or tarnish, ensuring a shaving tool that will remain a permanent fixture in your grooming regime. A luxurious, authentic way to shave, the Jack Black Double Edge Safety Razor has superior glide and minimises the amount of pressure needed, preventing razor burn and bumps. Before use, ensure skin is free from dirt and debris. Apply shave cream to the face and place the razor perpendicular to the face, allowing the curved top of the razor head to come in contact with the skin. Then, lower the razor to the proper 30-degree shaving angle and continue with the shave, making shorter, lighter strokes in the direction of hair growth. 1 Double Edge Safety Razor.